Nance Klehm teaching at the Permaculture Workshop Soul to Soil: From Waste to Fertility, Building Soil Fertility with Compost, Qatar University Plant Nursery, 19 March 2016. © Qatar University. Landscape is an emerging field and discipline that contributes to increasing the quality of life and improving urban ecosystems. It stands at the centre of today’s political, aesthetic, social and ecological discourses. With the emergence of new sustainability imperatives and the remerging of disciplines in a more holistic approach, landscape is no longer considered as merely a decoration that beautifies a building or a city, but as a vital infrastructure (hence the term, ‘landscape infrastructure’) that contributes to improving the health, vitality, and liveability of urban systems. It also contributes to improving resource efficiency, increasing food security and enhancing biodiversity. 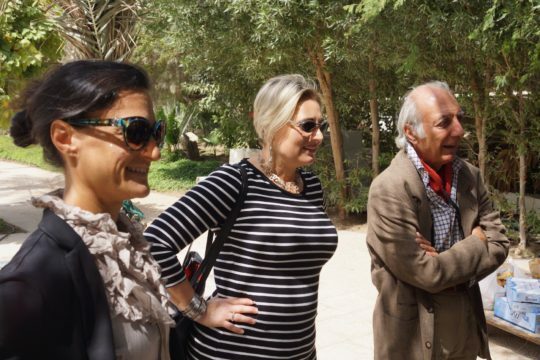 Permaculture designer Paige Tantillo, landscape architect Katrin Schulz-Barth and architect Marcello Terzano at he Permaculture Workshop Soul to Soil: From Waste to Fertility, Building Soil Fertility with Compost led by Nance Klehm, Qatar University Plant Nursery, 19 March 2016. © Qatar University. Nance Klehm teaching at the Permaculture Workshop Soul to Soil: From Waste to Fertility, Building Soil Fertility with Compost, Qatar University, 19 March 2016. © Qatar University. Permaculture can help to create landscapes that minimise resource use (water, energy, soil); increases recycling (organic waste, water); creates healthier produce, without pesticides and fertilisers, while at the same time promoting biodiversity of fauna and flora. Edible landscapes can contribute to the food security of the Qatar University campus and of Qatar, and also reduce the carbon footprint, food miles or distances that food travels to our plate. 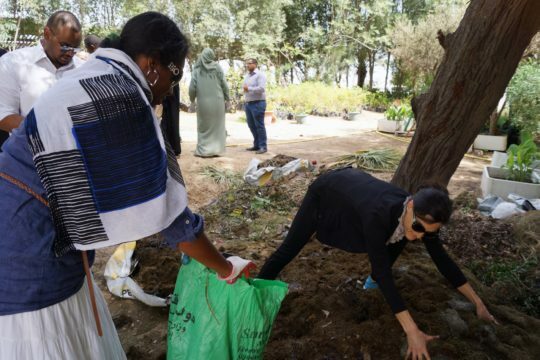 Gardeners and landscape engineers from Qatar University participating in the Permaculture Workshop Soul to Soil: From Waste to Fertility, Building Soil Fertility with Compost, Qatar University Plant Nursery, 19 March 2016, led by Nance Klehm. © Qatar University. The permaculture garden project is envisioned as an interdisciplinary project that will involve different departments and research centers at Qatar University, and will contribute to the vision of creating an ‘edible campus’ there based on urban permaculture principles. It brings together academics and practitioners, and also involves the campus facilities engineers and gardeners, the expatriate workers and students at Qatar University, looking at ecological, social and economic values of integrated and holistic landscape practices and systems. The Qatar University Edible Campus project is a key focus of UNI, UN-Habitat’s partnership with universities worldwide, analysed on its website. Luzita Ball graduated in 1992 with a BSc in Agroforestry from the University College of North Wales, Bangor, in Wales. She completed the theoretical part of a course in Permaculture Design in 1993, and in 1998 was awarded an MA in Urban Regeneration from the University of Westminster, London. In October 2016 she started a Higher Degree and Doctorate programme in Environmental Sciences at the University of Northampton, UK, researching the role of permaculture in urban sustainability. She is currently on an eco-committee coordinating an ecogarden at a local primary school as well as helping to move forward the Qatar University Permaculture Garden, both projects intended as tools for education, through demonstration, interaction and research. Last year she worked as a Graduate Teaching Assistant at the Department of Architecture and Urban Planning, Qatar University, while completing one year of the PhD in Urban Planning programme. She has over the last 20 years in the UK and Qatar, written and published various articles and other educational materials on the Environment and Islam; given lectures and interactive workshops related to environmental management, permaculture and the use of medicinal plants; and produced and presented a series of radio programmes on topics related to Science, Environment and Islam. 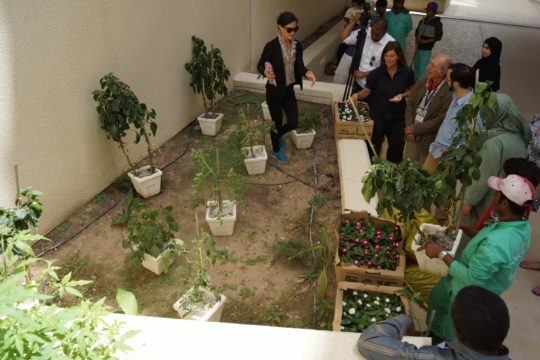 Permaculture designer Paige Tantillo takes part in the Permaculture Workshop Soul to Soil: From Waste to Fertility, Building Soil Fertility with Compost, Qatar University Plant Nursery, 19 March 2016, led by Nance Klehm. © Qatar University. Paige Tantillo is a certified permaculture designer, master gardener and artist with a Bachelor of Arts degree in Spanish Translation and Business. A native of Chicago, Paige currently resides in Doha, Qatar. Since receiving her permaculture certification in Jordan in September 2011, Paige has applied the permaculture techniques she learned to the challenging growing conditions locally. Using a combination of her new knowledge and skills gained earlier, she developed a permaculture test garden, which included grey water recycling, composting, and chickens to provide a food resource. Paige believes permaculture has enhanced her knowledge, allowing her to create fresh and unique garden designs. She constantly seeks ways to be more sustainable and to share that knowledge with others. Her goal is to inspire and educate youth and the community about the importance of sustainability and its connection to healthy living. Her projects and initiatives in Qatar include the Edible Landscaping Project with Qatar University; Youth Environmental Awareness and Gardening Club; vegetable garden design for PassivHaus in Qatar; developing a curriculum for an educational garden programme, and designed and implemented programs for local schools; designing handson permaculture and organic workshops; presentations on permaculture, soil and composting; permaculture garden design for private residents and schools. ‘Qatar: Growing Food in the Desert’, in ‘What Food Means to Me’, AlJazeera, feature by Tamila Varshalomidze, 2015.